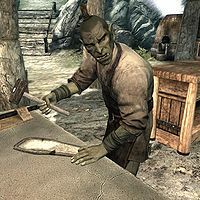 Umurn is an Orc warrior living in Dushnikh Yal, the Orc stronghold southeast of Markarth. He works the forge along with his mother, Gharol. Umurn is just one of many sons of Chief Burguk and with the lesser-ranked forge-wife as his mother, Umurn has no choice but to work around the clock. He helps his mother at the forge every day between 8am and 8pm and then dives into Dushnikh Mine where he spends the entire night either mining, wandering, or eating. He carries a leveled mace and a bow (up to Orcish quality at level six) with a number of leveled arrows. Even if he never gets to sleep there, he also carries the key to Burguk's Longhouse, along with a selection of common items and gold. When you approach him, he will tell you a bit about his life in Dushnikh Yal: "I work the forge, with my mother Gharol. We mine our own ore and shape our own metal. ", "One day I will shape a weapon fit for a chief. Maybe that chief will be me. ", and "I help in the mines as well as the forge." He will also admit that one day, he will have to follow Orc tradition for the title of chief: "One day, I must fight my brother Nagrub for chiefdom. It will not be easy." If you talk to Nagrub, he will concur: "Brother Umurn is a strong warrior. I look forward to fighting him for chiefdom one day." and "One day, I intend to be chief. I will fight my father and my brother for it, as is tradition."